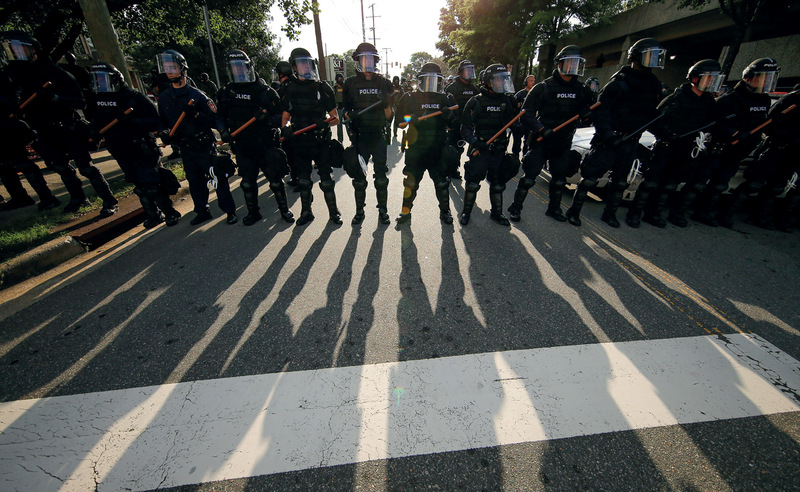 In the US, police often decide who has the right to demonstrate and who doesn’t. In this case riot police in Durham, North Carolina form an armed phalanx to control people attempting to protest against a white nationalist rally. It beggared belief – a line of armoured St. Louis police chanting ‘Whose streets? Our streets!’ But that’s exactly how they trumpeted their power in September as they cleared the streets of people protesting against police brutality. The officers were celebrating the acquittal of one of their own on charges of the unjustified killing of a black motorist. Of course, it is no surprise to anyone that heavily armed police control US streets, often acting like armed militias occupying poor communities. What was different was the sheer brazenness of using a chant, made famous by the Occupy movement, to glorify their own power. Usually such arbitrary police activities are justified by professionalized gobbledygook. But it is a sign of the times. In those countries that even allow demonstrations a police permit is usually required to exercise this ‘right’. The control of public space – streets, squares, parks, even Barcelona’s polling stations – is increasingly subject to arbitrary state intervention to try to prevent unapproved political expression. Such public spaces – Tahrir Square in Cairo and Gezi Park in Istanbul, for example – have long been rallying places for expressing dissent. The freedom to use public space is one of a set of crucial rights that together comprise democracy. Stopping people doing so significantly reduces the possibility of opposition. It is part of a broad establishment strategy that critics, such as the citizens’ rights advocacy group Civicus, refer to as ‘the closing of political space’. Across the political spectrum, and across the world, this space is being squeezed. Repressive tools include everything from ad hoc administrative regulation, restrictive legislation, misuse of anti-terrorist measures, surveillance, draconian border controls, heavy-handed policing, manipulation of the judiciary, arbitrary arrest and imprisonment, even torture and murder. The Civicus folks have a map to rate the health of national political space using set categories – ‘closed’, ‘repressed’, ‘obstructed’, ‘narrowed’ and ‘open’. According to their reckoning only two per cent of the world’s population now enjoy truly ‘open’ political space, which is to be found in countries including Ireland, Portugal, Germany and much of Scandinavia. For the rest of us it’s an uphill struggle. Neither of the two main political trends – rightist populist nationalism on the one hand and neoliberalism (of both centre-Right and centre-Left) on the other – have much use for open political space. While they talk a different language and may use different methods, they share a common desire to turn political space into an administered zone. From Viktor Orbán in Hungary to Vladimir Putin in Russia, to Donald Trump in the US and Mariano Rajoy in Spain, any commitment to meaningful democratic rights is paper thin. This is also true in many places throughout the Global South. In India, once considered ‘the world’s largest democracy’, the space to organize is under intense pressure from the Hindu fundamentalist regime of Narendra Modi. In a France traumatized by terrorism, basic rights of freedom of expression and assembly (remember liberté, egalité, fraternité?) are under threat. In nominally democratic Peru, the government is even using ‘preventive charges’ against activists if it gets wind of future plans of resistance. Our freedoms are pretty fragile these days. By freedoms I’m thinking about all the little ones: freedom of speech, freedom of assembly, of privacy, of communication, of opinion, of movement – in short freedom to say ‘yes’ or ‘no’ to the government. I’m not thinking here of the big F ‘Freedom’ that at least some of those taking away our actual freedoms claim to be striving to protect. This big F version seems to have more to do with the freedom to manoeuvre by those who run the state and the corporations that control the economy. They have little interest in the fragile freedoms of everyday life – often seen as annoying obstacles to growth and profit. Their right to manoeuvre and our right to resist rub up against each other. The big F Freedom is articulated in many ways, but its final point of reference remains a national sovereignty exercised by centralized nation-states to pursue elite-defined national interests and make sure its ‘own’ citizens are obedient. Any state that monopolizes power, be it autocratic or representational, is prone to capture by powerful elites: usually large transnational corporations and international banking conglomerates. Any counter-power – vigorous labour and social movements, a lively civil society, a reciprocal and democratic economy – requires the oxygen of political space if it is to breathe. These days our current system of centralized representative government is in serious trouble. Large numbers no longer bother to vote. Political parties have trouble attracting members. There is a huge disconnect between the self-image of politicians (enlightened and selfless servants of the public interest) and how the general public regards them (manipulative liars bent on feathering their own nests). While partisan politics generate a lot of heat there are few significant policy differences and actual achievements remain pathetic. The inability or unwillingness of most political and bureaucratic elites to solve, or even address, basic questions of runaway inequality and looming ecocide has left their legitimacy in tatters. Repression is often the only card left in their hand. Dutch author David Van Reybrouck, in his recent, provocatively titled Against Elections: The Case for Democracy, refers to this as Democratic Fatigue Syndrome. He and a great many others are making a strong case that democracy is badly in need of a rethink. Radical theorists Michael Hardt and Tony Negri, in their groundbreaking Assembly, see a democracy of participation as our best chance for achieving a healthy post-capitalist world. An emerging consensus of these critics holds that we need to move in the direction of popular participation and away from remote representation by an aristocratic caste. There is a plethora of projects and ideas afoot to democratize our money-driven variant of representation. These include a radical municipalism where local government steps in to fill the void left by the absentee national state. A commons-based democracy based on collectively managing and expanding what we hold in common (from air to air waves) rather than watching them ruined through privatization. Ideas for a more participatory democracy include: citizen juries to discuss policy options; a return to a rotating drawing of lots to fill important positions; revocable mandates; participatory budgeting; more direct rule through legislative initiative from below; fairly organized and thoughtful referenda; and local assembly democracy. But these are controversial and far-reaching changes likely to be resisted by both die-hard nationalists and those with wealth and power at stake. That is why the need to defend and widen political space is so vital. If activists committed to recreating democracy are to have any chance they need to be have their basic rights protected. Without the rights to freely communicate, assemble and organize (all now under pressure almost everywhere), a truly participative democracy will never happen. Indeed, we are likely to lose even the meagre democracy we have. It is essential to stop the current clampdown on rights. Shrinking political space: take action! Michael Hardt and Tony Negri, Assembly, Oxford University Press, 2017. David Van Reybrouck, Against Elections: The Case for Democracy, Bodley Head, 2016.